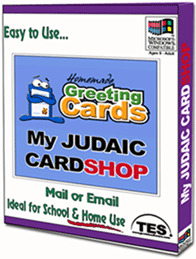 Judaic Cardshop is ideal for every type of card, from Brit to Bar Mitzvah and yes... they will make gorgeous "Thank You" cards too. 1,000's of Professionally Drawn Images. Divided into categories in separate folders makes finding the pictures you want simple. Send email cards directly from program.